District Education Officer B.Venkatanasamma said that the one minute late rule will not apply to the exam this year. Students will be allowed to appear for the exam even if they are late by five minutes to the centre. At the same time, the Directorate has asked students to reach the centre 45 minutes before commencement of the exam. If hall tickets lost Students may download from www.manabadi.co.in or bsetelangana.org. Students can contact the control room number 040-29701474 for Exam doubts and Problems. Telangana 10th Class board has released 10th class Halltickets for the year 2019 through online. The details of the links to download 10th hall tickets are available in the page. Students who are about to write 10th class 2019 can download these halltickets and get signed from the principal of their respective school. The same halltickets attested by the principal should be shown before entering into the examination centre. Directorate of Government Examinations is an independent department functioning under ministry of secondary education, Government of Telangana. The department is responsible for conducting the SSC/OSSC Public Examinations. Telangana SSC Hall tickets 2019 available to download @ manabadi.co.in, bse.telangana.gov.in. Students can check TS SSC (10th) public exam Regular Hall tickets Check here. Telangana Board of Secondary Education will conduct the SSC Board of Regular exam in the month of March 2019. 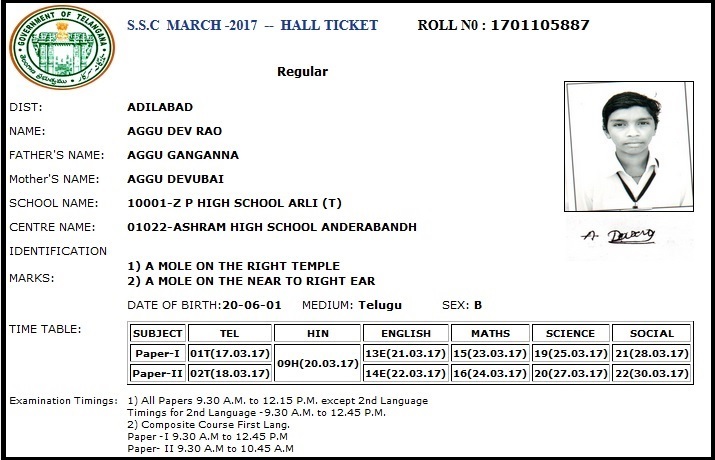 Candidates, who are going to appear in this exam, Download your TS SSC Hall tickets March 2019 From TS board Official website and manabadi.co.in. The Hall tickets of Directorate of Government Examinations Telangana (SSC) Class 10th examinations will be available From 2nd Week of March 2019. The Students who are appearing for the same are required to check the official website bse.telangana.gov.in or manabadi.co.in in order to download the hall tickets. After taking out the print out of the hall tickets, the students will have to get it signed by the principal of their school. TS Board is conducting the SSC Regular examinations From March 15, 2019. To 02nd April 2019. The hall tickets for the same have been released on the official website of TS board, the link for which is bse.telangana.gov.in. How to Download TS SSC Class 10th hall tickets 2019? BSE Telangana official page, www.manabadi.co.in or http://bse.telangana.gov.in/? visit this page initially or just click the direct link given below.